As well as this Characters Blog Jill also writes about Plant Stories from Langthorns where she has been working for about 5 years, taking care of the shade-loving and the conservatory plants. She has a master’s degree in Garden History and is particularly interested in the stories of plants, people and connections. She is also occupied researching the Role of Orchards in the Renaissance. There are so many interesting characters from the worlds of garden design, garden writing and botanical art; from explorers and collectors and from great landowners and dedicated nurserymen. The following Snippets will give a flavour of the rich diversity of stories to be told. For more characters try: The Head Gardeners by Toby Musgrave and Gardening Women by Catherine Horwood. In the eighteenth century painting was seen as an accomplishment for a young lady that may improve her marriage prospects. For the Scottish heiress Elizabeth Blachrie, it became a little more practical – and ultimately essential. She had married her second cousin, Alexander Blackwell and both had fled to London after he was challenged for practising as a physician without the necessary qualifications. He then set up as a publisher, but without the prerequisite training he was fined and sent to debtors’ prison in Highgate. To pay his mounting debts she used her talent as an artist along with her connections with Isaac Rand, the director of the Chelsea Physic Garden; Sir Hans Sloane, its benefactor (who later provided the founding collection of what became the British Museum, Natural History Museum and British Library); and Philip Miller, its renowned gardener; to produce a record of the plant material in the garden, which could be used as a medical aide. The resulting book, A curious herbal: containing five hundred cuts, of the most useful plants, which are now used in the practice of physick, took her two years, for she not only drew every plate, she also engraved them onto copper for the printers and then hand coloured every page (jobs normally undertaken by craftsmen). From 1737 to 1739 Blackwell published four plates and one page of text each week, until she had produced 500 which were bound into two volumes. There are at least 15 copies of this book still in existence (The British Library holds three copies, and one is at the Royal College of Physicians) and it is known that she eventually was obliged to sell publication rights to raise additional money. Due to his wife’s diligence, Alexander Blackwell was released from prison, and after some more ill-fated business ventures left for Sweden in 1742. Carl von Linne (the world famous botanist known as Linnaeus) reported that he became over-friendly with the wife of his landlord - who then died in suspicious circumstances. However, due to his connections, Blackwell was appointed physician to the King of Sweden but then got involved in a political conspiracy which backfired when he became accused of treason. In 1748 Blackwell was executed. Elecampane (Inula helenium), plate 473. 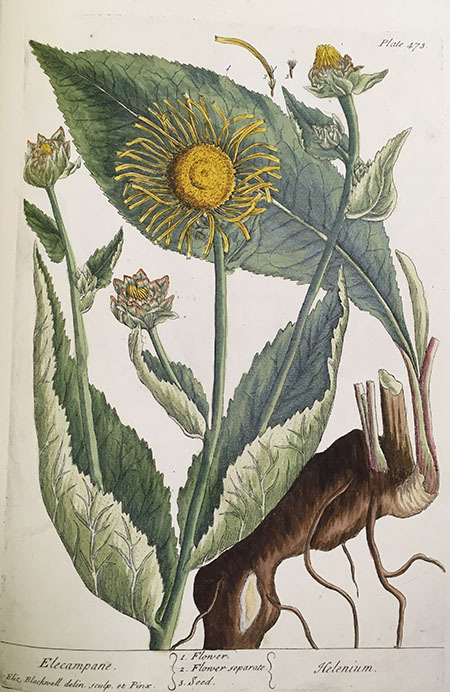 Elizabeth Blackwell’s monumental achievement was to produce an outstanding work of botanical illustration; she was the first British woman to produce a herbal which identified on the plates the parts of the plant that were useful to the medical profession; and the first woman to draw, engrave and colour every plate herself by hand. Banner image: detail, Swiss Cottage, Osborne House, 1855, W.L. Leitch, RCT.